Posted on June 18, 2012	by Lou Murray, Ph.D. I think the only way I can get a Harvest Monday post done on a Monday is to do it in the wee hours, i.e., by staying up late Sunday night. It is now 2 am west coast time. I just updated my year total for fruits and vegetables. Check the sidebar to the right. My goal for the year is 350 lbs, or half the amount of produce that an average American couple eats. That will be 100 lbs more than I produced in either of the past two years, so I have my work cut out for me. This is a record year for fruit harvest. I have already exceeded the pounds of fruit harvested in 2010 and 2011 and it’s only June. I still have avocados, peaches, nectarines, lemons, limes and apples to harvest. My vegetable harvests are finally kicking into a higher gear after the skimpy harvests of green stuff early in the year. My vegetable total to date is 114 lbs. Not too shabby for such a little yard. I have a Gro-Pot of blue potatoes in our driveway that is nearly ready to harvest, and the tomatoes and squash look like they’re going to give me a crop this year. I may finally be getting the hang of this vegetable garden thing. About time. I’ve been gardening since 1962. Here are the makings of a nice Italian side dish. 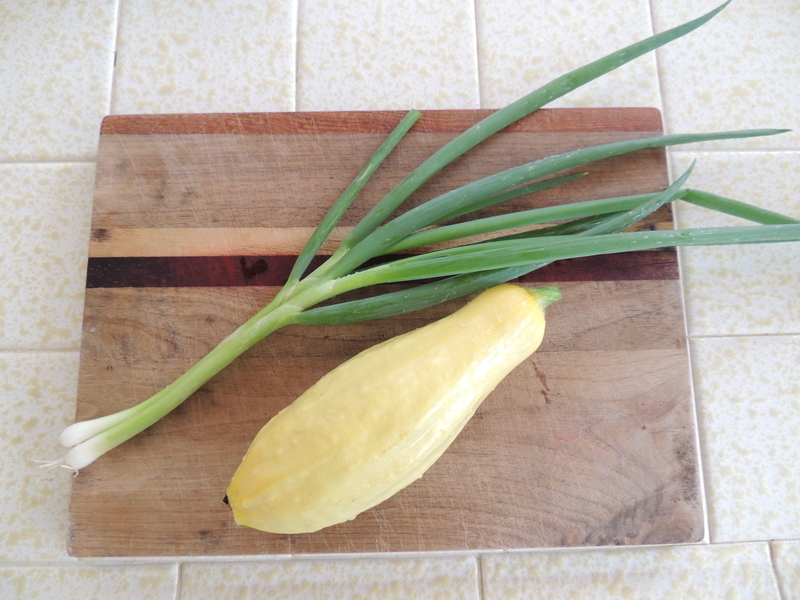 Saute sliced squash, onion, and garlic in olive oil until squash is browned. Add a splash of vinegar and top with grated Parmesan cheese. 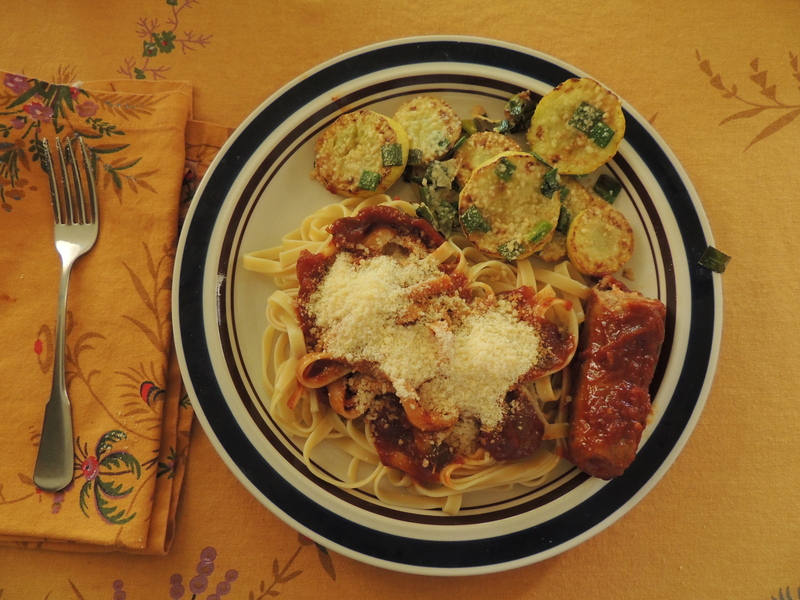 Here is the squash sauté plus some fettucini with Italian sausage and spaghetti cause canned in 2010. Didn’t get enough tomatoes last year to can any sauce, although a froze a few packages. That’s all gone and I’m down to my last two jars of spaghetti sauce. The entire harvest of apricots, plus nearly the entire harvest of blueberries and a handful of strawberries, made two servings for our breakfast. Those tree ripened apricots were incredibly sweet, best I’ve ever eaten. 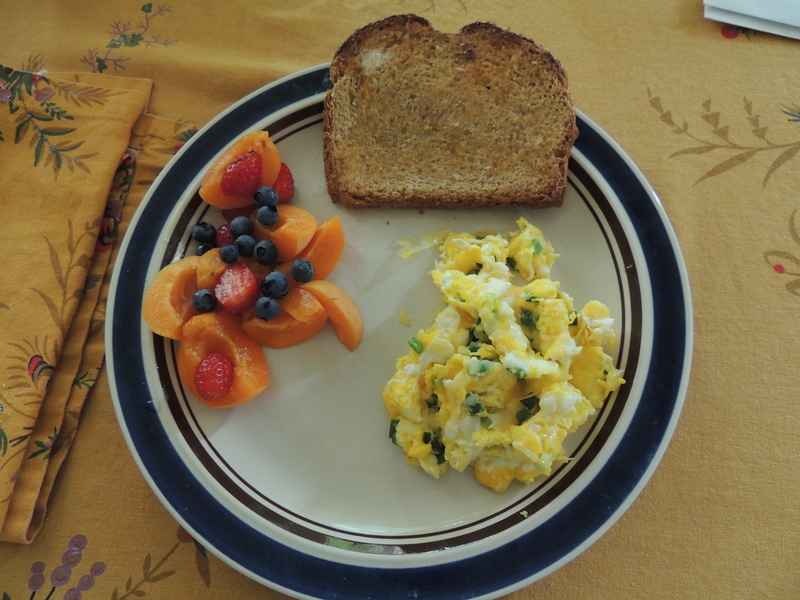 The chickens contributed the eggs for our scramble, which has green onions from the garden and grated cheese. 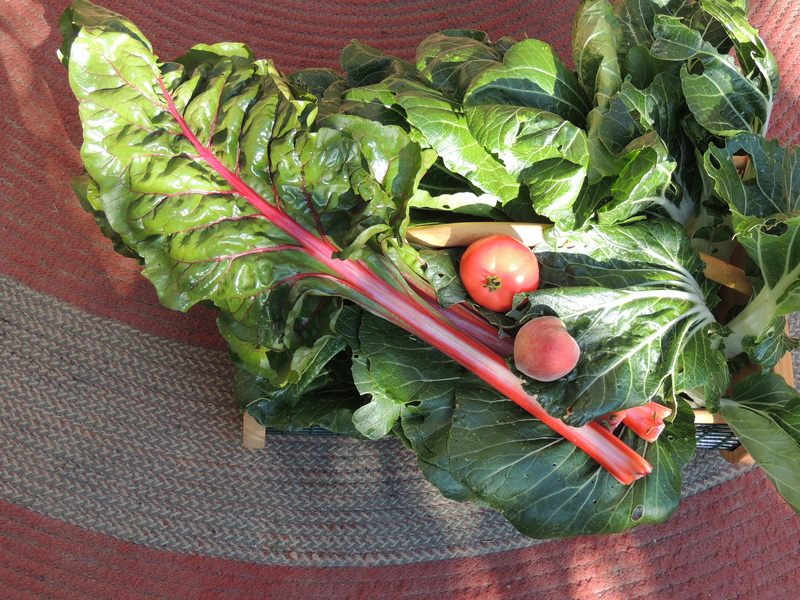 Four lbs of bok choy, some chard, our first ripe tomato, and the first Babcock peach of the season filled my harvest trug. Look again. The first tomato of the season is snuggled next to a Babcock peach in that photo. Mortgage Lifter won the race. It deserved its own photo, but I was pressed for time. Not sure who is going to come in second as none of the others are close to ripening. 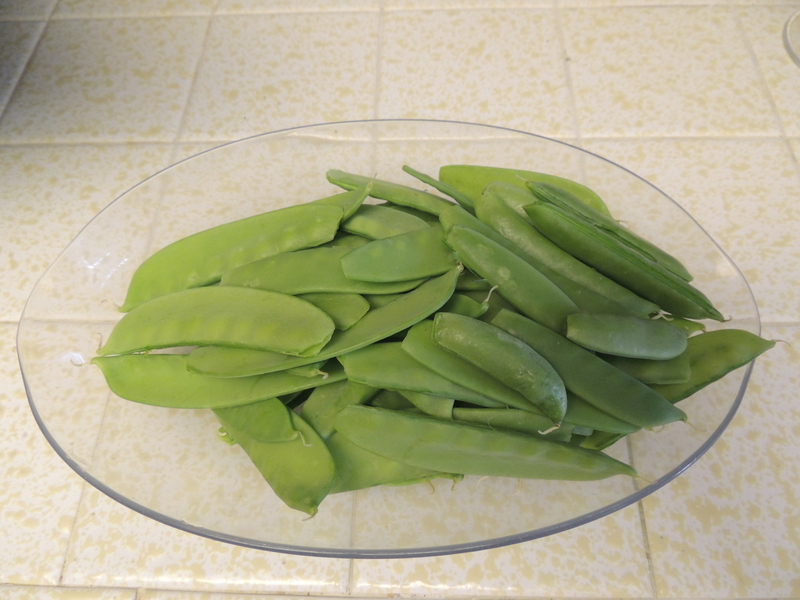 Today’s harvest of snow and sugar snap peas (10 oz) went into a stir fry along with bok choy, chard, and some slices of leftover steak. This entry was posted in Uncategorized and tagged first ripe tomato, Harvest Monday, harvest totals, southern California, vegetable garden. Bookmark the permalink. Wow.. you’ve had a lot of harvesting so far this year! I didn’t know how many lbs of veggies people ate a year.. good to know to help with a produce goal. Julie, I had to look that up. I can’t believe that a couple really eats that much fresh produce unless they’re counting all of the French fries that Americans eat. Wow, 100 plus pounds already this year is great! Our goal this year is 800 pounds, but we grow a lot of potatoes! Keep up the great work! Rick, amazing. I can’t imagine what I would do with 800 lbs of produce to process. Tree ripened apricot, I am drooling. You are half way to meet your produce goal and more than that for your eggs, congrats. Norma, I wish I had some apricots to share with you. I wish I had some more for me. Four just wasn’t enough. But now the Babcock peaches are ripening, so i’m satisfied. Good work on your harvest totals to date and for having set for yourself a specific goal. I do my Harvest Monday posts on Sunday evening because I cannot do that and get ready for work on Monday morning too. It works out just fine and then I just “link up” on Monday morning (which I do have time to do before getting out the door!). Ah, but Kitsap, sometimes I can’t get around to it, like this week. You have company, I just posted my harvest, and I’m not keeping track of the total this year, otherwise it’ll put me more behind schedule. My weekends are always busy unless I do my post in the middle of the week or something like that. Excuses excuses excuses…..
Yeah, Mac, seems like valid excuses to me. For me the peach is the star. I so want fresh grown peaches. I love them to death. Daphne, the peach from our Babcock Improved was like ambrosia. I’ve never had a peach with such perfume. It was like jasmine. Great harvest! I like the pictures showing how you use your harvest, and so easy! you have a lovely and varied harvest this week. I haven’t set a specific poundage goal for the year, my main goal is to eat fresh from the garden every day and so far that has pretty much been true. Maryhysong, Good luck with your goal too. Bee Girl, my passion with gardening has come and gone and come and gone and now it’s here again.